FightingArts.com - A Simple Lesson In Body Mechanics: Are You Losing Power In Your Punch? Are You Losing Power In Your Punch? 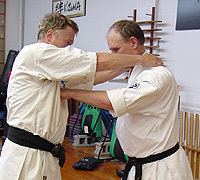 If you practice basic, karate-type punching, you are probably not aware that you are losing some of the power of your punches. I'm not talking about ways to generate more power into your punch. That's the subject of another article. I'm also not talking about the basic mechanics of punching that most people are aware of -- making a proper fist, keeping the punching arm close to the body, turning the fist over as it is extended, etc. What I am talking about is a small but important element of arm alignment that affects your efficient transmission of power. Most students and teachers are not even aware of this. When most people's punches make contact, some of the power transmitted through the arm doesn't make it. Instead, all too often the arm itself acts as a mini shock absorber that bends when the force between the puncher and target exceeds a certain level. A lot of readers are now saying, "not me. I've spent years developing my punch." You may be right, but it still may not be working to your full advantage. Here's is a simple test that I show people. First, I ask that the person do a basic middle punch at the level of my solar plexus, as illustrated. Then with the punch extended, I extend my arms around the puncher's shoulders and pull the puncher into me. When I do this almost everyone is surprised. As I pull them forward their elbow bends outward and starts to collapse. This means that elbow of the arm is positioned in a way that all the power of a punch may not be transmitted into the target. Instead, the arm absorbs some of the power and the person punching may never know it. This condition is created by the position of the elbow. Notice in the first photo that the elbow position is to the outside of the punching arm, even though the arm is straight. This is the elbow position that allows potential power absorption. In the second photo the elbow is turned, or rotated slightly downward. It doesn't feel natural at first and takes quite a lot of practice to perfect it. But, you can easily test its effectiveness. Try the same test as above. First, execute a middle punch the way you usually do it and then rotate your elbow downward. Another method to get the correct elbow position for this test is to execute a vertical punch and then rotate your fist into a traditional punch position being careful to keep you elbow in place. After you do this, then have someone, as the in above example, pull you in, trying to bend your elbow. See, it doesn't bend. This way all the power you generate with hip rotation, body weight, or dropping your weight can potentially be fully extended into your target. It can make a big difference. This is the reason, I believe, that some styles of karate, such as Isshin Ryu, punch with a vertical first. The advantage is not so much in the fist position, but in the elbow, which with a vertical fist naturally rotates downward. Besides power, this elbow position also has a secondary advantage. It protects your elbow from an attack from the side, a smash against the elbow or trap that would normally be used to straighten and then injure the elbow. With the elbow down, it is just not there to be attacked. Christopher Caile is the Founder and Editor-In-Chief of FightingArts.com. 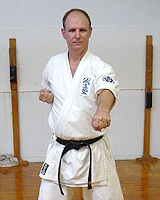 He has been a student of the martial arts for over 40 years and holds a 6th degree black belt in Seido Karate and has experience in judo, aikido, daito-ryu, boxing and several Chinese fighting arts. He is also a long-term student of one branch of Traditional Chinese Medicine, Qigong. He is a personal disciple of the qi gong master and teacher of acupuncture Dr. Zaiwan Shen (M.D., Ph.D.) and is Vice-President of the DS International Chi Medicine Association. In Buffalo, NY, he founded the Qi gong Healing Institute and The Qi Medicine Association at the State University of New York at Buffalo. He has also written on Qi gong and other health topics in a national magazine, the Holistic Health Journal and had been filmed for a prospective PBS presentation on Alternative Medicine. Recently he contributed a chapter on the subject to an award winning book on alternative medicine, "Resources Guide To Alternative Health" produced by Health Inform.